The fin whale spotted close to the Maltese islands. Photo: Adriana Vella. A fin whale was spotted close to the Maltese islands during ongoing local scientific cetacean research. The fin whale, about 17 metres long, very close to the 19-20 metres of the average-sized Mediterranean fin whales, was sighted repeatedly at a location not being disclosed for the protection of the animal, conservation biologist Adriana Vella, who heads the Dolphin and Whale Research Project, which she launched in 1996, said. The fin whale, the second largest animal on earth, can grow up to 25 metres long and can average 30 kilometres an hour when migrating. Though they may be found offshore in deep waters they can also spend time in relatively shallow coastal waters. The fin whale has a life span of about 85-90 years, if it does not fall victim to vessel collisions, entanglement in fishing nets, pollution, disease and sustained disturbances. Its diet may vary according to season and areas and could include herring, capelin and other shoaling fish, along with squid and euphausiids - krill-shrimp like crustaceans, and copepods. 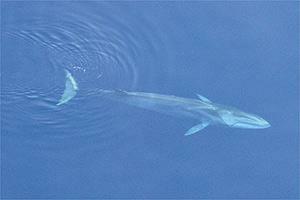 Fin whales can travel single or in pairs. Although the one spotted close to Malta was probably on its own, fin whales communicate effectively through eco-location. This is the production of low-frequency sounds inaudible to human hearing and which range from 15 to 30 Hz in long sequences detectable at long distances. In the Mediterranean, fin whales are mostly found in the Ligurian sea, where a 95,000-square kilometre fin whale sanctuary is located. Although fin whales are also found elsewhere, genetic studies have proved that the Mediterranean population is distinct from others. Dr Vella had launched the Dolphin and Whale Research Project as part of academic research at the University of Malta. It has since accomplished various important local discoveries including observations of hundreds of common dolphins, endangered in the Mediterranean Sea, sperm whales and the fin whale. The latest sighting was a record in this whale's proximity to the Maltese islands. The research, which contributes to the gathering of data on various marine species including turtles, seabirds and manta rays in the region, has been assisted by the Biological Conservation Research Foundation (Bicref). The long-term, year-round research effort has been possible through support by a number of entities such as the Malta Maritime Authority, the HSBC/Earthwatch research fellows and Vodafone Malta Foundation as well as the Armed Forces of Malta, fishermen and various sea users who report their sightings at sea. When such species ere encountered they should be fully respected and left undisturbed in their habitat maintaining a good distance of at least 100 metres. Increasing noise, vessel traffic, fishing nets and pollution affects the survival of such species, which required sustained conservation monitoring and actions. As partners of ACCOBAMS, the Agreement for the Conservation of Cetaceans of the Black Sea, Mediterranean Sea and Contiguous Atlantic Area, Dr Vella and Bicref send their recommendations to this regional body for cetacean conservation needs in the Mediterranean. For more information or assistance with the project one can contact Dr Vella at avel@cis.um.edu.mt or Bicref at bicref@nextweb.net.mt.